US District Court, Brooklyn, N.Y.
NARA M1164. 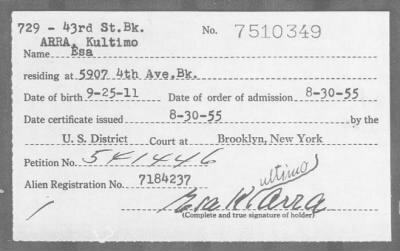 A card index to naturalization petitions filed in the U.S. District Court for the Eastern District of New York from November 1925 through December 1957. This publication has been divided into three sets: July 1865 - September 1906; October 1906 - November 1925; and November 1925 - December 1957. In this set you will find typed cards with the petitioner's name, address, age, and when he was admitted as a citizen. With the volume and petition number you can then locate the original document.